When I was a kid, search engine optimization was simpler. Pick a target phrase and use it on the page. Put it in your title, header and body text. Pretty straightforward. These are still (and will always be) the SEO basics. But then a shift made SEO more subtle, more complex and more interesting. Today, search rankings aren’t just about choosing and using a target keyphrase. It’s about the broader meaning of that phrase and the intent of the searcher. SEO is about topics, not keyphrases. This post is a specific, step-by-step process for semantic SEO writing and keyword targeting. Follow these steps to adapt your content and future-proof your rankings or watch this quick video that explains it all. Google is officially a semantic search engine, which means it’s connecting visitors to answers. To pages that contain the meaning they’re looking for, not just the letters and words they typed into that little box. To adapt to this megatrend, you need to target a broader topic, not just the specific phrase. Using related phrases in your writing, covering the subtopics that are semantically related to your main topic. There are several ways to find those phrases are semantically related, deep inside the heart of Google. First, just start typing your primary target keyphrase into Google. Notice how it begins suggesting search terms? As you slowly type in each letter, you’ll see more. Type in another letter as if you’re starting a new word. Try entering a question word at the beginning of your phrase. You’ll soon find a wealth of words connected to your topic. Shortcut! A fast way to find all of the phrases is KeywordTool.io. It suggests every phrase Google would suggest as if you typed in the next letter of the alphabet 26 times. Scan through and put some of these on your list. Next, just search for your target keyphrase and scroll down to the bottom of the search results. See the “search related to…” links? Those are phrases that are connected to your meaning. See anything you missed? Put these on your list. 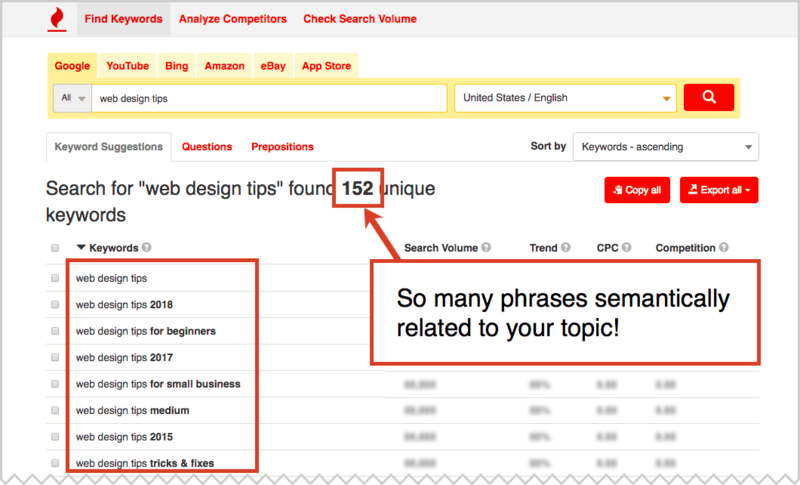 You can use competitive analysis tools to find even more related phrases. Search for your main target keyphrase again. See the top-ranked page for your target phrase? That page likely ranks for many dozens of related phrases. 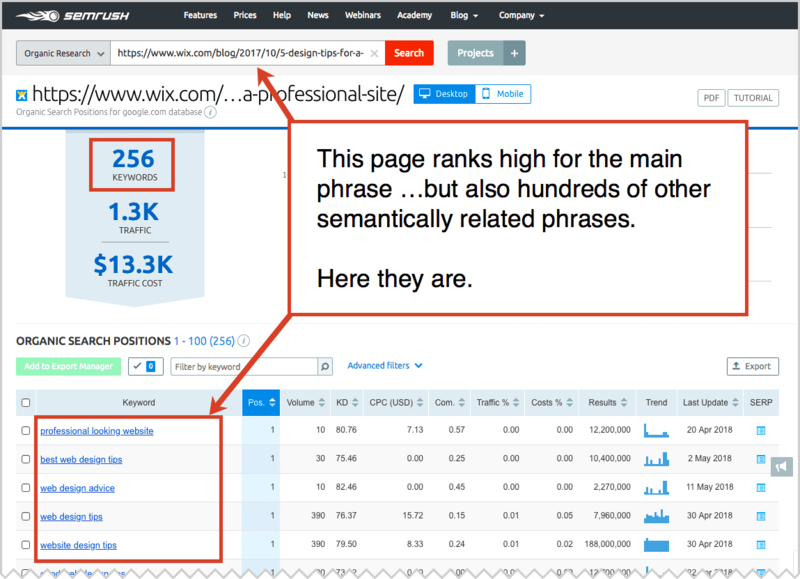 To find a list of all the phrases for which that page ranks, put that top-ranked site into a rank checking tool such as SEMrush (note: the free version gives you some data, the paid version gives you all of it). See the related phrases? Put these on your list. 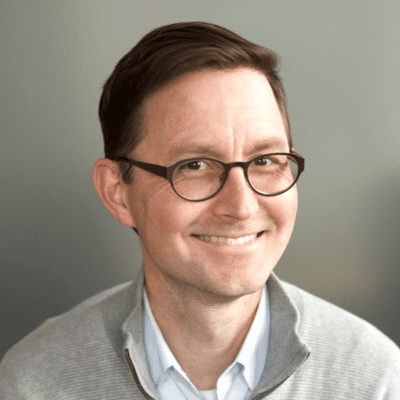 By now, you should have a nice list of phrases and subtopics, all of which are semantically connected to the article you were about to write. The list might be within your content marketing template or just on a paper next to your keyword. It doesn’t matter. …simply incorporate these ideas and phrases into the piece. Find ways to include them in the natural flow of the writing. As you use each phrase, cross it off the list. Here is the list of phrases and subtopics I used as I wrote the web design tips article. This approach helps to indicate relevance for the broader topic, not just the specific phrase. But it also pushes you to create a more thorough, comprehensive article, which is what Google really wants after all. That’s semantic SEO! You might be surprised at what it does for the quality of your content. SEO can make you a better writer. Google answers questions. It’s one of the main reason people use it. With this simple understanding, a great way to adapt your content to the future of search is to find the questions related to your topic and answer them in your content. It sounds so straightforward, but a lot of content marketers miss this simple trick. The questions are everywhere. Keep your eyes open as you were searching for the related phrases in step one. You may see these. Another fun source for questions is Answer the Public. Just enter the topic and it will scrape the web for dozens of related questions. ProTip! A more powerful, more complete source of questions is the paid version of BuzzSumo (recommended). The question analyzer finds questions asked in Quora, Reddit, Stack Exchange and any niche site related to your topic. Once you’ve found the most relevant related questions, make sure to answer them in your content. The questions make great subheads and the answers might be the paragraphs below. Next, we have a grammar tip for those Q’s and A’s. Every day, millions of searches are done without keyboards. We are talking to our phones and smart speakers, and those voice-based queries tend to be longer, natural language phrases. They also tend to be questions. To adapt your content to this trend, optimize your content by using complete sentences that provide the complete meaning, both questions and answers. Notice how each of these sentences stands on its own? They contain full, semantic meanings. The idea is to write like you’re writing a dictionary will the full-sentence question and answer. This approach to semantic SEO writing is also good for traditional SEO. It can help you win the “featured snippet” that appears at the top of many Google search result pages. Getting your content here is like ranking #0, above all the others. The pages that become featured snippets tend to be the content that includes those full sentences that provide complete answers. Note: Featured snippets are always taken from pages that rank on the first page in Google to begin with. So don’t expect to ever be selected as the featured snippet if the content doesn’t also rank high. It’s those featured snippets that are powering Google voice search. So it’s an important type of semantic relevance. Here we see how this kind of writing helped win the featured snippet in the skin care example above. Notice how the grammar helps Google know what the page is about. We have now adapted our writing for voice search and featured snippets. The first example is a “short click” and the second is a “long click.” The difference is dwell time. 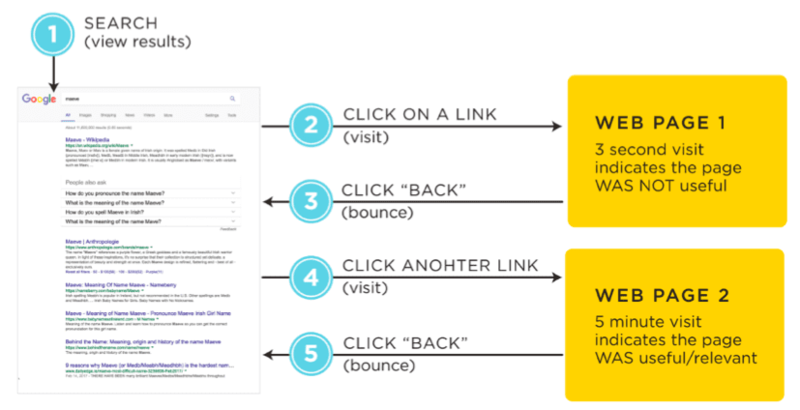 Dwell time is the amount of time spent on a page after the visitor arrives from the search engine. It has a powerful correlation with quality and relevance so search engines use it as a search ranking factor. 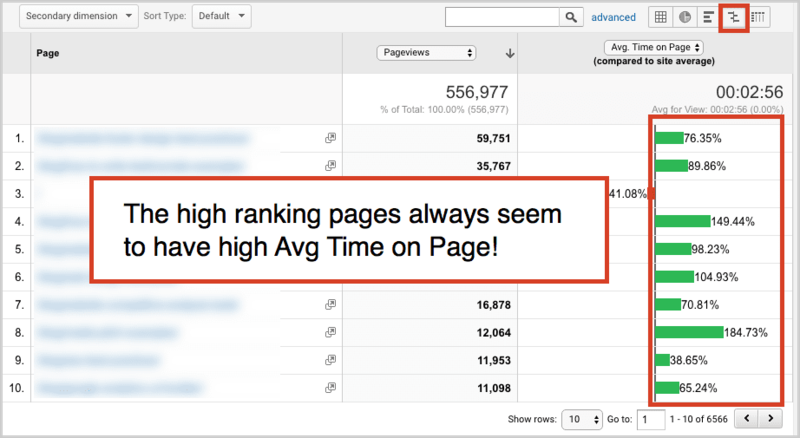 You may be able to see the correlation between rankings and time on page in your own Analytics. Look at the Behavior > Site Content > All Pages report. Set it to comparison view for Avg Time on Page. There’s your correlation! We have adapted our content for user interaction signals in search algorithms. 5. Adapt to all future changes! Make the best page on the internet for your topic. Have you make a page that is expert, authoritative and trustworthy? Make the best page on the web for your topic and you’ve future-proofed your content for all future SEO changes. Tip! Want to see every phrase that a page ranks for? Follow the steps in this post: What do I rank for? You don’t have to be a computer scientist to adapt your content. You don’t need to understand “latent semantic indexing” or what an ontological library is. 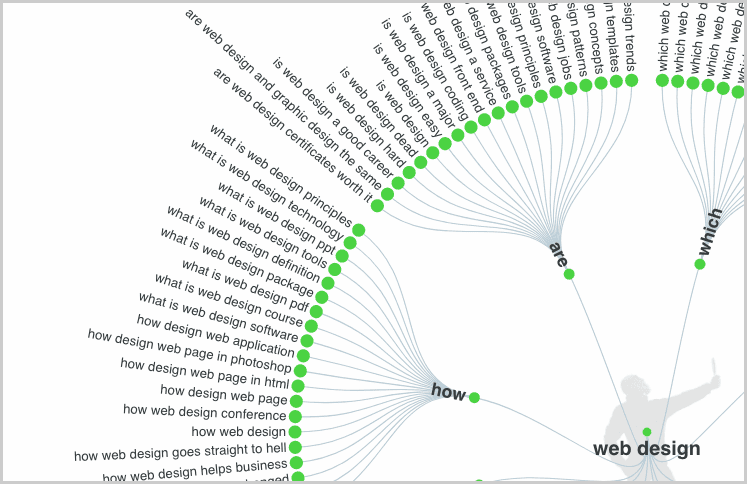 Although the brains behind semantic search may be very complex, the process for making better content is not. Excellent article (as always) practical and thorough! One area I struggle with using the tools suggested is that in a B2B space with limited ‘conversations’ it means that they are all low volume phrases. Wonder if you have any practical advice or come across a similar challenge before? This is one of my favourite websites. I always have so many epiphanies reading your blogs!